A systematic look at the patterns of rights abuses in the United States’ domestic “war on terror” since September 11, 2001. How John Walker Lindh Became “Detainee 001”: The father of a young man captured while fighting for the Taliban in 2001 reminds us of the "dark side" of US policy after 9/11. Why Are Queer Activists and Muslim Scholars Holding Vigils Outside a Manhattan Prison? As young Muslim men disappear into US prisons for crimes they haven't committed, activists demand justice. Why Has President Obama Deported More Immigrants Than Any President in US History? Since 9/11, immigration has become increasingly tangled with criminal enforcement and national security. How a British Citizen Was Stripped of His Citizenship, Then Sent to a Manhattan Prison: Britain’s citizenship deprivation processes may help obscure the Obama Administration's willingness to kill and kidnap Britons. The Torture That Flourishes From Gitmo to an American Supermax: A civil rights attorney reports from the belly of the post-9/11 justice system. Five Years Ago, Obama Pledged to End Torture. He Still Hasn’t: Waterboarding may have ended, but the US continues to torture terrorism suspects in American prisons. Guantánamo in New York City: Americans remain mostly blind to the abusive treatment of terror suspects on US soil. Censored in Colorado: Why did a Colorado prison prevent Fahad Hashmi from reading a Nation article about his incarceration? Where’s the Outrage When the FBI Targets Muslims? 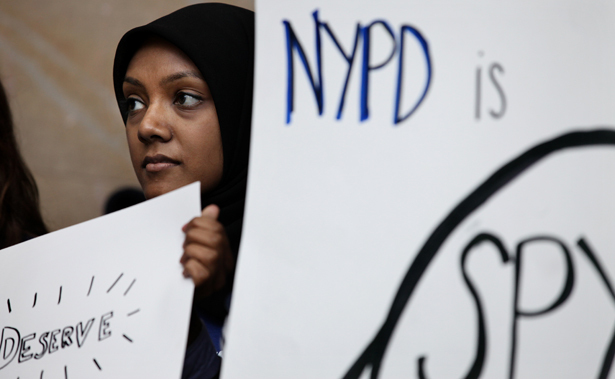 The FBI employs the same repressive tactics as the NYPD in its broad surveillance of Muslim communities. Why does the FBI get a pass? How Mohammed Warsame Became an Accidental ‘Terrorist’: In the wake of 9/11, prosecutors have embraced “special administrative measures” to keep terrorism suspects guilty until proven otherwise. How Tarek Mehanna Went to Prison for a Thought Crime: As the government embraces a “counter-radicalization” approach to counter-terrorism, prosecutors are turning radical beliefs into criminal acts.